Over 26 million copies sold worldwide. The Bhagavad-gita is the compact essence of all spiritual philosophy; at the onset of a world war, the warrior Arjuna asks his friend Krishna about the purpose of life, the difference between the self and the material body, and how to understand the ultimate cause of all causes. In just over seven hundred verses, Krishna comprehensively answers all of Arjuna's questions and then reveals His identity as the Supreme Personality of Godhead Himself, appearing on earth to usher in a new era of spiritual understanding. Krishna teaches that the essence of the yoga system—and the ultimate goal of all pious works, meditation, and austerity—is to develop an attitude of loving service to the Supreme Person. His ultimate instruction, "surrender to Me," challenges us all to transcend "religion" or "belief" and enter the realm of bhakti—devotional service—which alone can fully satisfy the self. Bhagavad-gita As It Is is unique among Gita commentaries. Its translations and purports are the work of His Divine Grace A.C. Bhaktivedanta Swami Prabhupada, who represents a line of teachers in disciplic succession from Krishna Himself. Prabhupada's faithfulness to Krishna's teachings—and expertise in presenting them to western readers—make Bhagavad-gita As It Is true to its title. 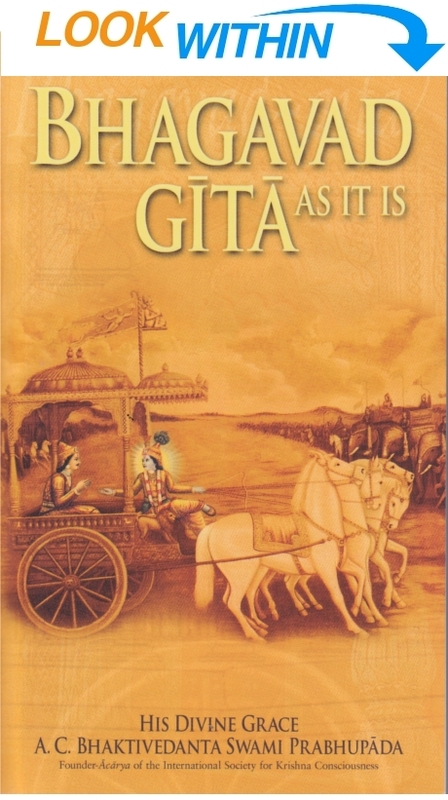 Since its publication in 1970, Bhagavad-gita As It Is has become the standard reference edition of the Gita worldwide. Original Language: Sanskrit; Date: 3,000 B.C. Narrated by Dravida Dasa. Approximately 27 hours. Sanskrit, English translations and purports. Narrated by Amal Bhakta Dasa. Approximately 3 hours and 50 minutes. English translations only. Narrated by Titiksava Karunika Dasa; produced by Kamlesh Patel. Approximately 2 hour and 39 minutes. Narrated by Bhakta Jayesh Salunke; produced by Kamlesh Patel. Approximately 3 hours. Narrated by Savyasachi Dasa; produced by Kamlesh Patel. Approximately 2 hours and 51 minutes. Translations narrated in Hindi. The sanskrit and purports are not included. Narrated by Ragahva Dasa; produced by Kamlesh Patel. Approximately 3 hours and 41 minutes. Sanskrit verses only. The translations and purports are not included. Narrated by Uddhava Dasa; produced by Kamlesh Patel. Approximately 3 hours and 48 minutes. Translations only. A learned scholar who has studied the Vedas perfectly and has information from authorities like Lord Chaitanya and who knows how to apply these teachings can understand that Krishna is the origin of everything in both the material and spiritual worlds, and because he knows this perfectly he becomes firmly fixed in the devotional service of the Supreme Lord. He can never be deviated by any amount of nonsensical commentaries or by fools. All Vedic literature agrees that Krishna is the source of Brahma, Shiva and all other demigods. In the Atharva Veda (Gopala-tapani Upanishad 1.24) it is said, yo brahmanah vidadhati purvah yo vai vedah ca gapayati sma krishnah: “It was Krishna who in the beginning instructed Brahma in Vedic knowledge and who disseminated Vedic knowledge in the past.” Then again the Narayana Upanishad (1) says, atha purusho ha vai narayano ’kamayata prajah srijeyeti: “Then the Supreme Personality Narayana desired to create living entities.” The Upanishad continues, narayanad brahma jayate, narayanad prajapatih prajayate, narayanad indro jayate, narayanad ashtau vasavo jayante, narayanad ekadasha rudra jayante, narayanad dvadasadityah: “From Narayana, Brahma is born, and from Narayana the patriarchs are also born. From Narayana, Indra is born, from Narayana the eight Vasus are born, from Narayana the eleven Rudras are born, from Narayana the twelve Adityas are born.” This Narayana is an expansion of Krishna. It is said in the same Vedas, brahmanyo devaki-putrah: “The son of Devaki, Krishna, is the Supreme Personality.” (Narayana Upanishad 4) Then it is said, eko vai narayana asin na brahma na ishano napo nagni-samau neme dyav-aprithivi na nakshatrani na suryah: “In the beginning of the creation there was only the Supreme Personality Narayana. There was no Brahma, no Siva, no water, no fire, no moon, no stars in the sky, no sun.” (Maha Upanishad 1) In the Maha Upanishad it is also said that Lord Siva was born from the forehead of the Supreme Lord. Thus the Vedas say that it is the Supreme Lord, the creator of Brahma and Siva, who is to be worshiped. Lord Krishna is the source of all generations, and He is called the most efficient cause of everything. He says, “Because everything is born of Me, I am the original source of all. Everything is under Me; no one is above Me.” There is no supreme controller other than Krishna. One who understands Krishna in such a way from a bona fide spiritual master, with references from Vedic literature, engages all his energy in Krishna consciousness and becomes a truly learned man. In comparison to him, all others, who do not know Krishna properly, are but fools. Only a fool would consider Krishna to be an ordinary man. A Krishna conscious person should not be bewildered by fools; he should avoid all unauthorized commentaries and interpretations on Bhagavad-gita and proceed in Krishna consciousness with determination and firmness. Pure devotees, whose characteristics are mentioned here, engage themselves fully in the transcendental loving service of the Lord. Their minds cannot be diverted from the lotus feet of Krishna. Their talks are solely on the transcendental subjects. The symptoms of the pure devotees are described in this verse specifically. Devotees of the Supreme Lord are twenty-four hours daily engaged in glorifying the qualities and pastimes of the Supreme Lord. Their hearts and souls are constantly submerged in Krishna, and they take pleasure in discussing Him with other devotees. In the preliminary stage of devotional service they relish the transcendental pleasure from the service itself, and in the mature stage they are actually situated in love of God. Once situated in that transcendental position, they can relish the highest perfection which is exhibited by the Lord in His abode. Lord Chaitanya likens transcendental devotional service to the sowing of a seed in the heart of the living entity. There are innumerable living entities traveling throughout the different planets of the universe, and out of them there are a few who are fortunate enough to meet a pure devotee and get the chance to understand devotional service. This devotional service is just like a seed, and if it is sown in the heart of a living entity, and if he goes on hearing and chanting Hare Krishna, Hare Krishna, Krishna Krishna, Hare Hare/ Hare Rama, Hare Rama, Rama Rama, Hare Hare, that seed fructifies, just as the seed of a tree fructifies with regular watering. The spiritual plant of devotional service gradually grows and grows until it penetrates the covering of the material universe and enters into the brahmajyoti effulgence in the spiritual sky. In the spiritual sky also that plant grows more and more until it reaches the highest planet, which is called Goloka Vrindavana, the supreme planet of Krishna. Ultimately, the plant takes shelter under the lotus feet of Krishna and rests there. Gradually, as a plant grows fruits and flowers, that plant of devotional service also produces fruits, and the watering process in the form of chanting and hearing goes on. This plant of devotional service is fully described in the Chaitanya-charitamrita (Madhya-lila, Chapter Nineteen). It is explained there that when the complete plant takes shelter under the lotus feet of the Supreme Lord, one becomes fully absorbed in love of God; then he cannot live even for a moment without being in contact with the Supreme Lord, just as a fish cannot live without water. In such a state, the devotee actually attains the transcendental qualities in contact with the Supreme Lord. The Srimad-Bhagavatam is also full of such narrations about the relationship between the Supreme Lord and His devotees; therefore the Srimad-Bhagavatam is very dear to the devotees, as stated in the Bhagavatam itself (12.13.18). Srimad-bhagavatah puranam amalah yad vaishnavanah priyam. In this narration there is nothing about material activities, economic development, sense gratification or liberation. Srimad-Bhagavatam is the only narration in which the transcendental nature of the Supreme Lord and His devotees is fully described. Thus the realized souls in Krishna consciousness take continual pleasure in hearing such transcendental literatures, just as a young boy and girl take pleasure in association. When a person knows the goal of life but is addicted to the fruits of activities, he is acting in karma-yoga. When he knows that the goal is Krishna but he takes pleasure in mental speculations to understand Krishna, he is acting in jnana-yoga. And when he knows the goal and seeks Krishna completely in Krishna consciousness and devotional service, he is acting in bhakti-yoga, or buddhi-yoga, which is the complete yoga. This complete yoga is the highest perfectional stage of life. A person may have a bona fide spiritual master and may be attached to a spiritual organization, but if he is still not intelligent enough to make progress, then Krishna from within gives him instructions so that he may ultimately come to Him without difficulty. The qualification is that a person always engage himself in Krishna consciousness and with love and devotion render all kinds of services. He should perform some sort of work for Krishna, and that work should be with love. If a devotee is not intelligent enough to make progress on the path of self-realization but is sincere and devoted to the activities of devotional service, the Lord gives him a chance to make progress and ultimately attain to Him. When Lord Chaitanya was in Benares promulgating the chanting of Hare Krishna, Hare Krishna, Krishna Krishna, Hare Hare/ Hare Rama, Hare Rama, Rama Rama, Hare Hare, thousands of people were following Him. Prakashananda Sarasvati, a very influential and learned scholar in Benares at that time, derided Lord Chaitanya for being a sentimentalist. Sometimes Mayavadi philosophers criticize the devotees because they think that most of the devotees are in the darkness of ignorance and are philosophically naive sentimentalists. Actually that is not the fact. There are very, very learned scholars who have put forward the philosophy of devotion. But even if a devotee does not take advantage of their literatures or of his spiritual master, if he is sincere in his devotional service he is helped by Krishna Himself within his heart. So the sincere devotee engaged in Krishna consciousness cannot be without knowledge. The only qualification is that one carry out devotional service in full Krishna consciousness. The Mayavadi philosophers think that without discriminating one cannot have pure knowledge. For them this answer is given by the Supreme Lord: those who are engaged in pure devotional service, even though they be without sufficient education and even without sufficient knowledge of the Vedic principles, are still helped by the Supreme God, as stated in this verse. The Lord tells Arjuna that basically there is no possibility of understanding the Supreme Truth, the Absolute Truth, the Supreme Personality of Godhead, simply by speculating, for the Supreme Truth is so great that it is not possible to understand Him or to achieve Him simply by making a mental effort. Man can go on speculating for several millions of years, and if he is not devoted, if he is not a lover of the Supreme Truth, he will never understand Krishna, or the Supreme Truth. Only by devotional service is the Supreme Truth, Krishna, pleased, and by His inconceivable energy He can reveal Himself to the heart of the pure devotee. The pure devotee always has Krishna within his heart; and with the presence of Krishna, who is just like the sun, the darkness of ignorance is at once dissipated. This is the special mercy rendered to the pure devotee by Krishna. Due to the contamination of material association, through many, many millions of births, one’s heart is always covered with the dust of materialism, but when one engages in devotional service and constantly chants Hare Krishna, the dust quickly clears, and one is elevated to the platform of pure knowledge. The ultimate goal, Vishnu, can be attained only by this chant and by devotional service, and not by mental speculation or argument. The pure devotee does not have to worry about the material necessities of life; he need not be anxious, because when he removes the darkness from his heart, everything is provided automatically by the Supreme Lord, who is pleased by the loving devotional service of the devotee. This is the essence of the teachings of Bhagavad-gita. By studying Bhagavad-gita, one can become a soul completely surrendered to the Supreme Lord and engage himself in pure devotional service. As the Lord takes charge, one becomes completely free from all kinds of materialistic endeavors. By nature’s own way the complete system of material activities is a source of perplexity for everyone. In every step there is perplexity, and therefore it behooves one to approach a bona fide spiritual master who can give one proper guidance for executing the purpose of life. All Vedic literatures advise us to approach a bona fide spiritual master to get free from the perplexities of life, which happen without our desire. They are like a forest fire that somehow blazes without being set by anyone. Similarly, the world situation is such that perplexities of life automatically appear, without our wanting such confusion. No one wants fire, and yet it takes place, and we become perplexed. The Vedic wisdom therefore advises that in order to solve the perplexities of life and to understand the science of the solution, one must approach a spiritual master who is in the disciplic succession. A person with a bona fide spiritual master is supposed to know everything. One should not, therefore, remain in material perplexities but should approach a spiritual master. This is the purport of this verse. Who is the man in material perplexities? It is he who does not understand the problems of life. In the Brihad-aranyaka Upanishad (3.8.10) the perplexed man is described as follows: yo va etad aksharaa gargy aviditvasmal lokat praiti sa kripanah. “He is a miserly man who does not solve the problems of life as a human and who thus quits this world like the cats and dogs, without understanding the science of self-realization.” This human form of life is a most valuable asset for the living entity who can utilize it for solving the problems of life; therefore, one who does not utilize this opportunity properly is a miser. On the other hand, there is the brahmana, or he who is intelligent enough to utilize this body to solve all the problems of life. Ya etad aksharaa gargi viditvasmal lokat praiti sa brahmanah. The kripanas, or miserly persons, waste their time in being overly affectionate for family, society, country, etc., in the material conception of life. One is often attached to family life, namely to wife, children and other members, on the basis of “skin disease.” The kripana thinks that he is able to protect his family members from death; or the kripana thinks that his family or society can save him from the verge of death. Such family attachment can be found even in the lower animals, who take care of children also. Being intelligent, Arjuna could understand that his affection for family members and his wish to protect them from death were the causes of his perplexities. Although he could understand that his duty to fight was awaiting him, still, on account of miserly weakness, he could not discharge the duties. He is therefore asking Lord Krishna, the supreme spiritual master, to make a definite solution. He offers himself to Krishna as a disciple. He wants to stop friendly talks. Talks between the master and the disciple are serious, and now Arjuna wants to talk very seriously before the recognized spiritual master. Krishna is therefore the original spiritual master of the science of Bhagavad-gita, and Arjuna is the first disciple for understanding the Gita. How Arjuna understands the Bhagavad-gita is stated in the Gita itself. And yet foolish mundane scholars explain that one need not submit to Krishna as a person, but to “the unborn within Krishna.” There is no difference between Krishna’s within and without. And one who has no sense of this understanding is the greatest fool in trying to understand Bhagavad-gita. Bhagavad-gita is universally renowned as the jewel of India's spiritual wisdom. Spoken by Lord Sri Krishna, the Supreme Personality of Godhead, to His intimate devotee Arjuna, the Gita's 700 concise verses provide a definitive guide to the science of self-realization. Indeed, there is no work even comparable in its revelations of man's essential nature, his environment and, ultimately, his relationship with God. His Divine Grace A. C. Bhaktivedanta Swami Prabhupada is uniquely qualified to present this English translation and commentary on Bhagavad-gita. He is the world's foremost Vedic scholar and teacher, and he is also the current representative of the unbroken chain of fully self-realized spiritual masters beginning with Lord Krishna Himself. Thus, unlike other editions of the Gita, this one is presented as it is—without the slightest taint of adulteration of personal motivation. Replete with sixteen full-color plates, this new edition is certain to stimulate and enlighten any reader with its ancient yet thoroughly timely message. "I owed a magnificent day to the Bhagavad-gita. It was the first of books' it was as if an empire spoke to us, nothing small or unworthy, but large, serene, consistent, the voice of an old intelligence which in another rage and climate had pondered and thus disposed of the same questions which exercise us." "When doubts haunt me, when disappoints stare me in the face, and I see not one ray of hope on the horizon, I turn to Bhagavad-gita and find a verse to comfort me; and I immediately begin to smile in the midst of overwhelming sorrow. Those who meditate on the Gita will derive fresh joy and new meanings from it every day." Although widely published and read by itself, Bhagavad-gita originally appears as an episode in the Mahabharata, the epic Sanskrit history of the ancient world. The Mahabharata tells of events leading up to the present Age of Kali. It was at the beginning of this age, some fifty centuries ago, that Lord Krishna spoke Bhagavad-gita to His friend and devotee Arjuna. Their discourse—one of the greatest philosophical and religious dialogues known to man—took place just before the onset of war, a great fratricidal conflict between the hundred sons of Dhritarashtra and on the opposing side their cousins the Pandavas, or sons of Pandu. Dhritarashtra and Pandu were brothers born in the Kuru dynasty, descending from King Bharata, a former ruler of the earth, from whom the name Mahabharata derives. Because Dhritarashtra, the elder brother, was born blind, the throne that otherwise would have been his was passed down to the younger brother, Pandu. When Pandu died at an early age, his five children—Yudhishthira, Bhima, Arjuna, Nakula and Sahadeva—came under the care of Dhritarashtra, who in effect became, for the time being, the king. Thus the sons of Dhritarashtra and those of Pandu grew up in the same royal household. Both were trained in the military arts by the expert Drona and counseled by the revered ”grandfather“ of the clan, Bhishma. Yet the sons of Dhritarashtra, especially the eldest, Duryodhana, hated and envied the Pandavas. And the blind and weak-minded Dhritarashtra wanted his own sons, not those of Pandu, to inherit the kingdom. Thus Duryodhana, with Dhritarashtra’s consent, plotted to kill the young sons of Pandu, and it was only by the careful protection of their uncle Vidura and their cousin Lord Krishna that the Pandavas escaped the many attempts against their lives. Now, Lord Krishna was not an ordinary man but the Supreme Godhead Himself, who had descended to earth and was playing the role of a prince in a contemporary dynasty. In this role He was also the nephew of Pandu’s wife Kunti, or Pritha, the mother of the Pandavas. So both as a relative and as the eternal upholder of religion, Krishna favored the righteous sons of Pandu and protected them. Ultimately, however, the clever Duryodhana challenged the Pandavas to a gambling match. In the course of that fateful tournament, Duryodhana and his brothers took possession of Draupadi, the chaste and devoted wife of the Pandavas, and insultingly tried to strip her naked before the entire assembly of princes and kings. Krishna’s divine intervention saved her, but the gambling, which was rigged, cheated the Pandavas of their kingdom and forced them into thirteen years of exile. Upon returning from exile, the Pandavas rightfully requested their kingdom from Duryodhana, who bluntly refused to yield it. Duty bound as princes to serve in public administration, the five Pandavas reduced their request to a mere five villages. But Duryodhana arrogantly replied that he wouldn’t spare them enough land into which to drive a pin. Throughout all this, the Pandavas had been consistently tolerant and forbearing. But now war seemed inevitable. Nonetheless, as the princes of the world divided, some siding with the sons of Dhritarashtra, others with the Pandavas, Krishna Himself took the role of messenger for the sons of Pandu and went to the court of Dhritarashtra to plead for peace. When His pleas were refused, war was now certain. The Pandavas, men of the highest moral stature, recognized Krishna to be the Supreme Personality of Godhead, whereas the impious sons of Dhritarashtra did not. Yet Krishna offered to enter the war according to the desire of the antagonists. As God, He would not personally fight; but whoever so desired might avail himself of Krishna’s army—and the other side could have Krishna Himself, as an advisor and helper. Duryodhana, the political genius, snatched at Krishna’s armed forces, while the Pandavas were equally eager to have Krishna Himself. The general pattern translators have followed in rendering Bhagavad-gita into English has been to brush aside the person Krishna to make room for their own concepts and philosophies. The history of the Mahabharata is taken as quaint mythology, and Krishna becomes a poetic device for presenting the ideas of some anonymous genius, or at best He becomes a minor historical personage. But the person Krishna is both the goal and the substance of Bhagavad-gita, so far as the Gita speaks of itself. This translation, then, and the commentary that accompanies it propose to direct the reader to Krishna rather than away from Him. The Bhagavad-gita thus becomes wholly consistent and comprehensible. Since Krishna is the speaker of the Gita, and its ultimate goal as well, the Bhagavad-gita As It Is thus presents this great scripture in its true terms. Bhagavad-gita is also known as Gitopanishad. It is the essence of Vedic knowledge and one of the most important Upanishads in Vedic literature. Of course there are many commentaries in English on the Bhagavad-gita, and one may question the necessity for another one. This present edition can be explained in the following way. Recently an American lady asked me to recommend an English translation of Bhagavad-gita. Of course in America there are so many editions of Bhagavad-gita available in English, but as far as I have seen, not only in America but also in India, none of them can be strictly said to be authoritative because in almost every one of them the commentator has expressed his own opinions without touching the spirit of Bhagavad-gita as it is. Here the Lord informs Arjuna that this system of yoga, the Bhagavad-gita, was first spoken to the sun-god, and the sun-god explained it to Manu, and Manu explained it to Ikshvaku, and in that way, by disciplic succession, one speaker after another, this yoga system has been coming down. But in the course of time it has become lost. Consequently the Lord has to speak it again, this time to Arjuna on the Battlefield of Kurukshetra. He tells Arjuna that He is relating this supreme secret to him because Arjuna is His devotee and His friend. The purport of this is that Bhagavad-gita is a treatise which is especially meant for the devotee of the Lord. —Dr. Edward C Dimock Jr.
Bhagavad-gita is universally renowned as the jewel of India’s spiritual wisdom. Spoken by Lord Sri Krishna, the Supreme Personality of Godhead, to His intimate devotee Arjuna, the Gita’s 700 concise verses provide a definitive guide to the science of self-realization. Indeed, there is no work even comparable in its revelations of man’s essential nature, his environment and, ultimately, his relationship with God. His Divine Grace A. C. Bhaktivedanta Swami Prabhupada is uniquely qualified to present this English translation and commentary on Bhagavad-gita. He is the world’s foremost Vedic scholar and teacher, and he is also the current representative of the unbroken chain of fully self-realized spiritual masters beginning with Lord Krishna Himself. Thus, unlike other editions of the Gita, this one is presented as it is—without the slightest taint of adulteration of personal motivation. Replete with sixteen full-color plates, this new edition is certain to stimulate and enlighten any reader with its ancient yet thoroughly timely message.